We describe two patients with this complication and report a variable visual outcome when associated with subretinal hemorrhage. 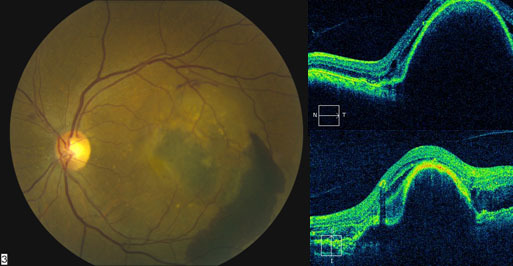 A 63 year-old woman with a past medical history of dry AMD presented with a PED and subretinal fluid in her left eye (Figure 1A). Her best corrected visual acuity (BCVA) was 20/100. She was treated with intravitreal bevacizumab 1.25mg on the initial visit. At one month follow-up, BCVA improved to 20/40 (Figure 1B). The patient received a total of eight intravitreal injections of bevacizumab 1.25 mg over a period of 12 months and, throughout this time, maintained a BCVA of 20/40. At the 14 month follow-up from baseline, examination demonstrated a hemorrhagic RPE rip involving the fovea (Figure 1C). Her visual acuity decreased to 20/400. 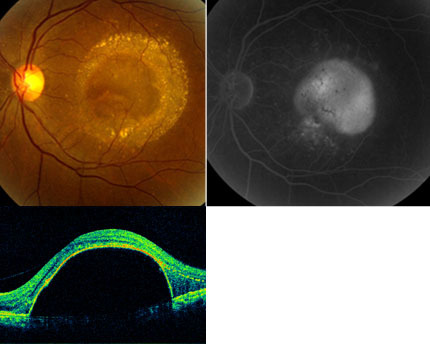 She was re-injected with intravitreal bevacizumab 1.25 mg and, 3 months later, her BCVA had improved to 20/50 (Figure 1D). She returned to her baseline visual acuity of 20/40 after additional intravitreal bevacizumab injections (4 months after the RPE rip) (Figure 1E). She received a total of 14 intravitreal bevacizumab injections. BCVA was 20/40 at last follow-up (28 months from baseline, and 1 month after the last injection). 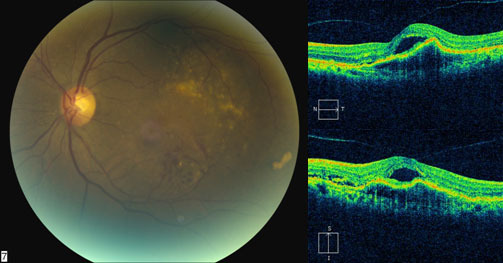 An 85 year-old woman with a past medical history of wet AMD (shallow PED) presented with a submacular hemorrhage and RPE rip in her left eye. Her BCVA was 3/200. Optical coherence tomography (OCT) demonstrated a RPE rip (Figure 2A). She was treated with intravitreal bevacizumab 1.25mg on the initial visit. At one month follow-up, her BCVA was 20/400 (Figure 2B). The patient received a total of seven intravitreal injections, alternating every two months between bevacizumab 1.25 mg and ranibizumab 0.5mg , over a period of 14 months. 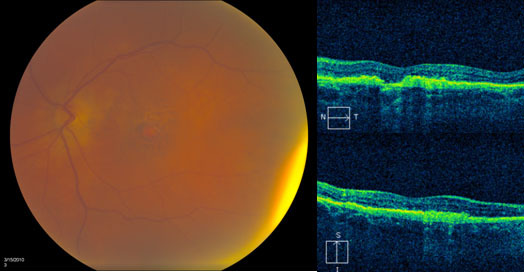 BCVA improved to 20/200, and trace intraretinal fluid was observed on OCT. At the most recent follow-up (16 months from baseline and two months after the last injection), BCVA was 3/200 and examination demonstrated significant cystoid macular edema associated with a recurrent PED (Figure 2C). 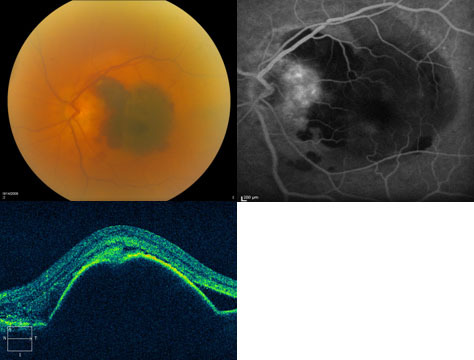 She was reinjected with intravitreal ranibizumab 0.5 mg.
A strong association between the height of the PED on OCT and the risk of RPE rip has been reported.5 Both patients reported in the current series had a bullous PED. The potential benefits of anti-VEGF treatment must be balanced with the risk of RPE rip in such patients. The definitive management of bullous PED and subretinal hemorrhage remains controversial. Options include observation, anti-VEGF therapy, photodynamic therapy or submacular surgery. Submacular surgery as performed in the SST group B trial did not increase the chance of stable or improved visual acuity and was associated with a high risk of rhegmatogenous retinal detachment, but did reduce the risk of severe VA loss in comparison with observation.6 The SST was performed before the use of OCT, and PEDs with or without RPE rips were not clearly identified. Both patients in the current report demonstrated anatomical improvement with continued intravitreal anti-VEGF treatment. Only patient #1 experienced a significant visual acuity improvement when treated with continued anti-VEGF therapy but has a persistent shallow residual PED. Hoskin A, Bird AC, Sehmi K. Tears of detached retina pigment epithelium. Br J Ophthalmol 1981;65:417– 422. 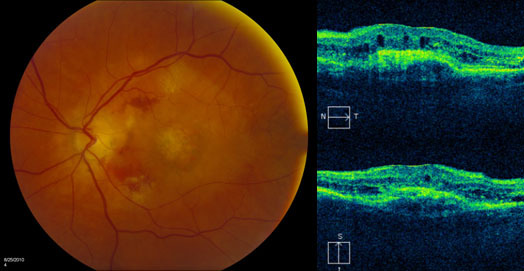 Chiang A, Chang LK, Yu F, Sarraf D. Predictors of anti-VEGF-associated retinal pigment epithelial tear using FA and OCT analysis. Retina. 2008 Oct;28(9):1265-9. Chuang EL, Bird AC. Repair after tears of the retinal pigment epithelium. Eye 1988;2:106–13. Chang LK, Sarraf D. Tears of the retinal pigment epithelium: an old problem in a new era. Retina. 2007 Jun;27(5):523-34. Review. Bressler NM, Bressler SB, Childs AL, et al. ; Submacular Surgery Trials (SST) Research Group. 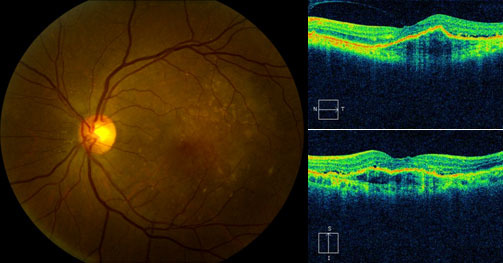 Surgery for hemorrhagic choroidal neovascular lesions of age related macular degeneration: ophthalmic findings: SST report no. 13. Ophthalmology. 2004 Nov;111(11):1993-2006.